If you are out and about in the city during the months of April to July, chances are you will witness—or be victim to—a crow attack. We are currently in the middle of the crows' nesting season, when baby crows are just coming out of their nests and learning to fly. While these young crows risk falling out of their nest, or are in danger of unaware pedestrians in their flight path, the crow parents are known to vigorously protect their young. According to CTV, the Wildlife Rescue Association of BC receives about 200 calls a day about crow attacks during this season. 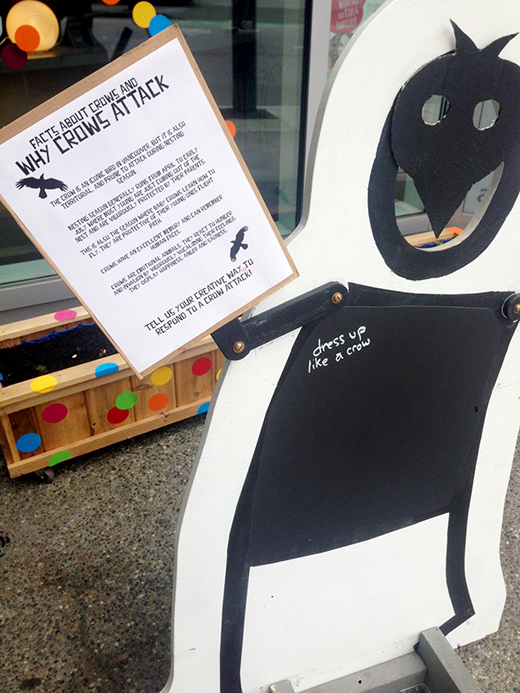 Over the recent years, Richards Street, where the ArtStarts Gallery is located, has gotten a reputation of being a high "crow attack" zone. Our staff and volunteers here at ArtStarts have witnessed many attacks and some have become victims themselves. There are also rumours and tales of our hair models from the neighbouring Blanche Macdonald Centre having their up-dos mangled while leaving the school. The crow is an iconic bird in Vancouver and we can't blame them for settling in this beautiful city as we have. We have to understand that crows are emotional animals too, as they can easily react to invasion to their nests by dive bombing on pedestrians. So let us practice understanding and compassion as we share our city with crows as they instinctively protect their young.